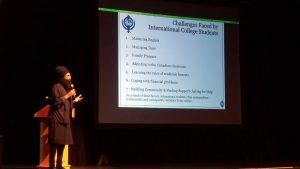 WINDSOR, Ontario: International students at St. Clair College and University of Windsor gathered for two sessions of Freshman Awareness Orientation on May 18. Attendance reached over 500 in the first session held at Chrysler Theater in St Clair Center for the Arts. About 100 students took part in another session held at Toldo Health Education and Learning Centre in University of Windsor, as the students spent the day learning about how to make their life successful in Canada. 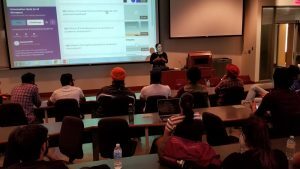 Windsor Gurdwara and Windsor Sikh Youth organized this event in collaboration with St Clair College and University of Windsor. This was an awareness orientation especially for international students to educate them of their student rights and duties. The event at St Clair Theater was opened by Mr. Amar Singh (Associate Vice President, Communications & I.T. at St Clair) who welcomed all and introduced Japman Kaur to conduct the proceedings as M.C. 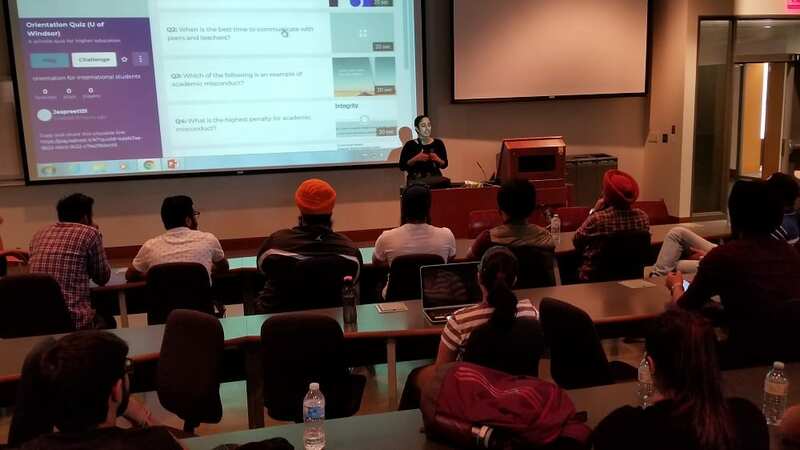 The keynote speakers were Dr. Jaspreet Kaur Bal, Balpreet Singh, Basant Singh and Harbinder Gill. Dr. Bal is a professor in the Child and Youth Care Program at Humber College in Toronto. A community organizer and educator, her practice involves radical youth work with underserved populations across North America. Bal serves on the Board of Directors of the Sikh Feminist Research Institute and Kaurs United International. She is also on the advisory board of the Sikh Research Institute. Dr. Bal discussed social and behavioural issues such as academic integrity, littering, swarming, respect, attitude, honesty, punctuality, cleanliness, transportation, fraud / scams, etc. Balpreet Singh received his law degree from the University of Ottawa. He became legal counsel for the World Sikh Organization of Canada in 2009. His practice focuses on human rights law and religious accommodation. Balpreet Singh has helped resolve several key accommodation issues for Sikhs in Canada and has appeared at the Supreme Court of Canada three times. He touched on Canadian norms and expectations, and various challenges faced by international students in Canada. 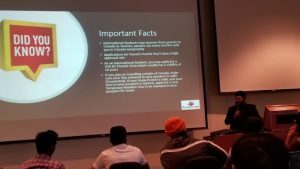 Robert Toor (aka Basant Singh), a Regulated Canadian Immigration Consultant, addressed all immigration issues. Gill is a Community and Corporate Affairs Officer in LaSalle Police Service, LaSalle, Ontario. He covered all law enforcement issues. There was a question and answer session. “The event was very interactive, informative and exceeded expectations of the attendees. 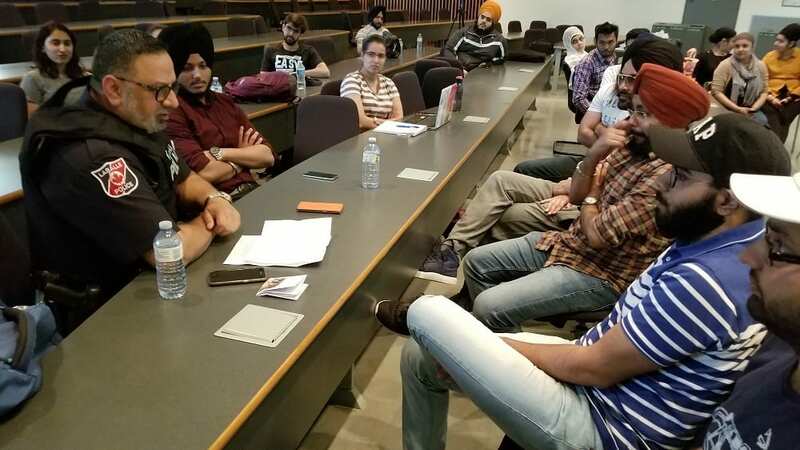 The Windsor Sikh community looks forward to holding similar events in the future to help our international students become successful in Canada”, said Harjinder Singh Kandola, President of Windsor Gurdwara run by Sikh Cultural Society of Metropolitan Windsor. Addressing the students, Kandola advised them to act responsible, get involved and make positive contribution to the community with service. Nathaniel VeltKamp, Manager, International Projects at St Clair, gave closing remarks and thanked all speakers, organizers and students for the resounding success of the event.